Initial reports had given some hope that some survivors might emerge from amongst the carnage, but by sunset last night it was clear that all hope was gone. No-one is quite certain what motivated the man to go on such a brutal killing spree, but neighbours have suggested it may be related to his fascination with roses and an upcoming flower show. 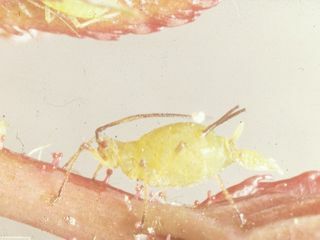 Plant fetishes have often been implicated in previous notorious aphid massacres. Distraught relatives and friends of the victims gathered on nearby branches in a mass outpouring of grief. Many had witnessed the attack, but could only look on in horror as those rushing in to help the injured themselves become victims of the poisonous chemicals. The SPCI is campaigning for the new Insect Welfare Bill to become law, which would for the first time protect millions of insects and other invertebrates from enduring serious ongoing neglect and cruelty each year, by legally obliging people to care for insects properly.